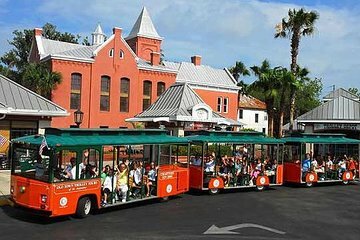 Explore the best of St Augustine on this one-hour narrated, hop-on hop-off Old Town trolley tour. At the 19 stops, visit more than 100 points of interest among the top attractions in America’s oldest city, founded in 1565 by Pedro Menendez de Aviles. Tour commences with boarding at any of the following stops. Get to know St Augustine and its top attractions on this hop-on hop-off trolley tour. Board one of the trolleys and enjoy the live commentary from an expert guide who knows this historic city inside and out. Hop off at any of the 19 stops, then hop back on when it’s convenient. Visit popular sites like the Old Jail , Potter’s Wax Museum, the Fountain of Youth National Archaeological Park, Castillo de San Marcos, Flagler College, Ripley’s Believe It or Not, and more. The Old Town Trolley pass is good for admission to the Florida Heritage Museum. Also, hop on the Beach Bus, with hourly service to St Augustine Beach, Downtown St Augustine and Anastasia Island. A sightseeing tour of St Augustine has never been easier — or more fun — than this hop-on hop-off tour of the city. Excellent way to see St. Augustine and learn of its history. Free parking was a bonus since parking is limited. This tour is worth every penny! Guides are informative, funny and helpful. They cover all areas of St Augustine and make it easy to park with out paying. Parking is expensive in St Augustine this elements the cost. Our last guide Davy Jones was so much fun and entertaining. It is great to be able to take the beach bus on the 1/2 hour and see the light house or have lunch on the beach. Most importantly they run on schedule. Thanks for helping make are time in St Augustine stress free. The Trolley Tour was interesting and informative, but the driver/guide of the 2nd trolley we got on was terrible. He (Troy) spoke so fast we could hardly understand him. When finally I asked him to slow his speech pattern down, he said he had lots of information he had to tell us so he continued speaking the same way. Others on the trolley had some difficulty understanding him too. The 3rd trolley driver/guide was fine. We understood the information with no problem. Management needs to check him out!!!! This activity was exceptional. It lasts about an hour and half if you stay on the trolley the whole time. The tour includes all of St Augustine's highlights and the trolley drivers make the trip interesting and informative. Be sure to hop off at the St Augustine Distillery and at the St Augustine Winery. From the winery you can walk to the Chocolate Factory. All three have tours and tastings. Highly recommend! Great for providing an initial overview of interesting sites in this beautiful and historical city--stayed on for the entire trip and then visited places of special interest. Whenever I see a hop-on on hop-off tour available through Viator in any location, I take it. I rely on Viator for high quality experiences and appreciate the selectivity used in offerings made available to travelers in any locale. The drivers were very good in providing background details to the various buildings in the town. The trolley was very crowded and some of our fellow riders didn't pay attention to the driver's instructions. Everything was great until the evening when the crowds were so large that we eventually just left and did not get to see the Night of Lights. Selling open ended tickets to unsuspecting visitors was a disservice.Do not expect to be able to see the Night of Lights on Dec 23rd, go either before or after the holiday. In addition all hotels and restaurant added unbelievable surcharges for the weekend. It was a rip off. Super great way to see the area. Take the bus one time around then decide what you wish to hop-off and see, hop-back-on to the next. Great way to see the city!